Reginald Clive Callister attended the School of Mines Ballarat (SMB) in 1909, studying geometry, algebra, and land surveying. 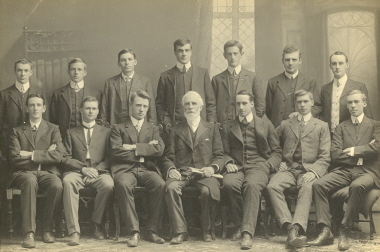 The 1910 SMB Student Magazine reported: 'We are pleased to announce that Reg. Callister has obtained a good position as assayer to the Hill Propriety Co., Kalgoorlie, W.A. Reg. only left us recently, and his quick promotion to his present position shows that the School's training must be appreciated in the West.' Callister became an Associate of the SMB in 1911 in Metallurgy. After serving during World War 1 he was appointed by the Commonwealth Institute of Science and Industry in Melbourne, to investigate Ballarat's white earthenware. Soon after, on 27 June 1919, it was announced that Callister would be attached to the SMB to carry out his duties, and to examine the possibility of establishing a pottery industry using local clays, specially the Lal Lal locality which was thought to be rich in clay deposits. The 1922 SMB Annual Report boasted: 'Considerable success had also rewarded the efforts of Mr. R.C. Callister in his investigations into the suitability of clays in the Ballarat district for the manufacture of white earthenware products. His porcelain productions compared favourably, it was said, with other specimens of high grade porcelain ware of that time. In conjunction with Mr Callister's investigations into clays, additional samples of decorative earthenware were manufactured on various occasions in the Technical Art School's Pottery Class and these samples had been "fired" with satisfactory results. At this time an electrical process for "baking" pottery was being tried at the Technical Art School and it was yielding good results which suggested the possibility of producing, at relatively low costs for clays in the Ballarat district, large quantities of porcelain ware for marketing. Callister, the eldest of 10 children, was born on 10 October 1889 at Ballarat East and died in Sydney on 21 September 1971.